The move from Spain to France with Rio, Part 4. My husband Phil�s elderly parents are coming to stay with us for a well-needed and much deserved holiday, and I�ve just discovered that his dad, Charles, who has Alzheimer�s Disease, doesn�t like big dogs! I was hoping he might forget (having A.D.) but a friend (in truth it was Alan) said I could always put a saddle on Rio and tell him he�s a horse. I was a bit worried about having them stay, as Rio is very used to having us all to himself and can sometimes get a bit jealous. I remember when, in Spain, I held a neighbours baby and he kept jumping up at me and squealing, wanting me to put the baby down or show it to him, which I wouldn�t do. It�s good for dogs to learn they have to give space and respect to a child, and sometimes that their owner will give attention to someone else, or even to each other. How many times have I heard about dog owners who actually have their dog in or on their bed and can�t move nearer to the partner as the dog is jealous! Dogs have to accept that they are the lowest in the household pecking order, or there�ll be trouble. With Phil�s parents, I was worried that Rio may guard his food like he used to when he was small, and that they wouldn�t know how to behave towards him. They are in their 80�s and as far as I know have never owned a dog. We collected dad Charles and mum Gladys from the airport, having left Rio behind on his chain in the back garden, hoping it wouldn�t rain as he has no shelter there. Our car cruised into the gravelled driveway at the front of the house and we could hear his excited yelps as we brought them inside. We took Rio off his lead and he came bowling indoors to greet them, bowing his head just like a circus pony - all he needed was a pink feather on his head. He ran behind Charles as he went out to admire the acre of garden, and followed him across the lawn. As he got to the boundary, just near a wonderful six-foot-across-wine barrel (empty unfortunately), Rio started barking at him and running back and forth trying to get him back towards us. I was a little bit worried - was Rio being nice or horrid? I ran indoors to find the packet of doggie treats, put one into Charles� hand and asked him to give it to Rio. After a nervous few seconds, Rio sat for him and they made friends. Phew. One day Phil�s mum, Gladys, couldn�t find Charles anywhere in the house. Due to his illness, he has a habit of wandering and forgetting where he is, so she was quite concerned. In the distance, she thought she could hear Rio bark. She followed the sound and went out into the lane. There was Rio lying across the road barking at Charles and not allowing him to go any further away from the house. What a good boy! We were so proud of him! He actually made sure that Charles was safe and followed them both back to the house having done his shepherding job well. I needn�t have worried at all. This was wonderful as we could all relax; not having to worry that Charles would wander off and get lost. Throughout their stay, each night after his walk, he went into their bedroom and put his head round the door to check they were there safe and sound, then came up with us to bed. Every morning he looked in their room to see they were there. Then we found out why Rio was so fond of Charles - we discovered he was feeding him his ice cream from his own spoon! Yuck! We go to the bar in the village some Fridays for drinks. Everyone who speaks English goes there, whatever nationality - French, Belgian, Dutch, Brits� Fridays at 6pm. It�s a good opportunity for me to practise my French for a while, too. The first time we went, we walked in and there was a big �Ooooooh! � at Rio, as if he was a celebrity! It was lovely; we basked in Rio�s glory. 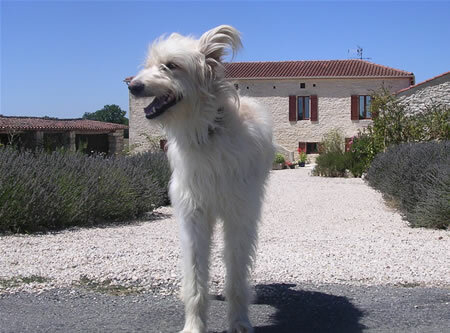 He�s very popular with the locals, even those who don�t usually like dogs. No wonder my husband likes taking him for walks without me. This week there was a wine tasting event going on - well worth doing as most of us bought a case. I was just saying how well behaved a young German Shepherd was and he jumped up and spilt my red wine all over me. I had to take off my top for his (dog trainer) owner to throw some white wine at it. I�ve never been in a wet T-shirt competition before�great fun. One Sunday we went for lunch at this local bistro-type bar / restaurant. The waiter laid a table on the terrace in the sunshine for us, while we sat at the bar for our gin and tonics. The food was delicious. We had langoustines to start, followed by roasted duck, and then a gorgeous Tarte aux Pommes (apple tart) to finish. This was all accompanied by red wine from a local vineyard, which gave both of us headaches later on, as we are not used to it. Rio was very well behaved, lying there with his bowl of cool water in the shade next to the table and it was a nice chance to chat to some of the locals. I usually save any bones from my plate along with a bit of meat as a treat for Rio for sitting nicely. Then along came a little black mixed breed dog. The couple at the next table said they didn�t think he had a home as he was always mooching around the place looking for a bite to eat. I had a good look at him and decided from his teeth he must be quite old, also he had some grey hairs where black should be. It must have been the wine stewing my brain, as I gave him Rio�s leftovers, which he devoured with relish. I felt so sorry for him and a couple at another table said we should take him home, as he would make a lovely companion for Rio. I really considered it for a moment, then thought I preferred Rio to be our only dog at the moment. If he hadn�t made any friends, maybe I would have thought differently, but I thought that if we acquired another dog I would perhaps prefer it to be younger than this one so I could train it. Just as well, as I later found out that the little rascal lived right next door to the restaurant and came there every day for scraps. Usually from my plate. Or even if you haven�t�.! © Sue Dayman Mauroux, Lot.